WASHINGTON (Reuters) - U.S. President Donald Trump said on Wednesday he does not mind if the public is allowed to see the report that Special Counsel Robert Mueller is preparing about his investigation of Russian meddling in the 2016 presidential election and any possible links to the Trump campaign. 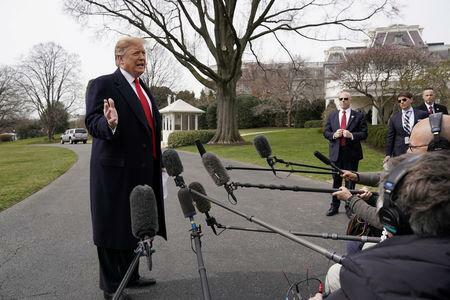 "Let it come out, let people see it, that's up to the attorney general ... and we'll see what happens," Trump told reporters at the White House. "We'll see if it's fair," he added. Mueller is preparing to submit a report to U.S. Attorney General William Barr on his findings, including Russia's role in the election and whether Trump unlawfully sought to obstruct the probe. Trump has denied collusion and obstruction. Russia has denied interfering in the election. Asked if the public should be allowed to see the report, Trump said: "I don't mind." He said he had no idea when it would be released. "I had the greatest electoral victory - one of them - in the history of our country, tremendous success, tens of millions of voters and now somebody's going to write a report who never got a vote," he said. 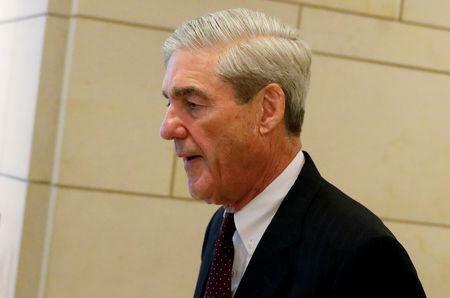 Mueller was appointed to handle the Russia investigation in May 2017 after Trump fired FBI Director James Comey, who had been overseeing the effort. Mueller has previously held several senior positions in the Justice Department, including FBI Director.